It is so cold in parts of the United States that iguanas are falling from their perches in suburban trees. Temperatures have dipped below 5 degrees Celsius in parts of South Florida this week, according to the National Weather Service in Miami. That is chilly enough to immobilise green iguanas common in Miami’s suburbs. Locals and news agencies have posted photos online of iguanas lying belly-up on the ground in odd locations, such as on the road or next to swimming pools. The cold-blooded creatures native to Central and South America start to get sluggish when temperatures fall below 10C, said Kristen Sommers from the Florida Fish and Wildlife Conservation Commission. If temperatures drop below that, iguanas freeze up. The green iguanas are not the only reptiles stunned by the record-breaking cold snap in the United States. 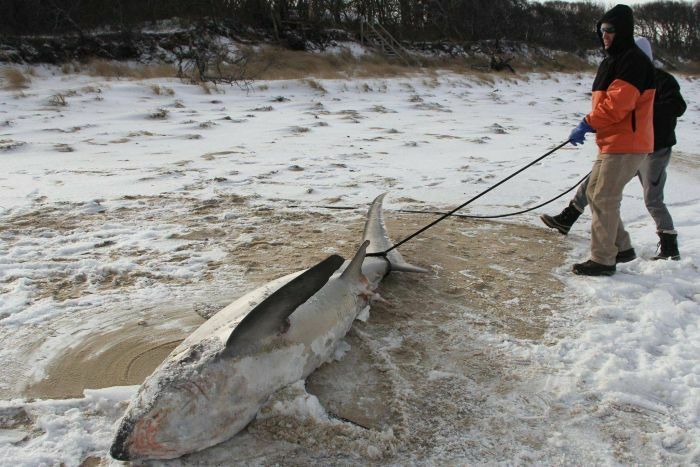 Sharks that have been frozen completely solid have been washing up on a beach in Massachusetts, and sea turtles also stiffen up when temperatures fall. The wildlife commission’s biologists have been rescuing cold-stunned sea turtles found floating listlessly on the water or near the shore, but no such rescue is planned for iguanas. They can grow over 1.5 metres long and their droppings can be a potential source of salmonella bacteria, which causes food poisoning. The wildlife commission has begun holding workshops to train homeowners and property managers to trap or manage iguanas. The reptiles may be easier to catch this week, Ms Sommers said. “This provides an opportunity to capture some, but I’m not sure it’s going to be cold enough for long enough to make enough of a difference,” she said.